Employee wellness programs have multiple benefits, both for the employers and the employees. 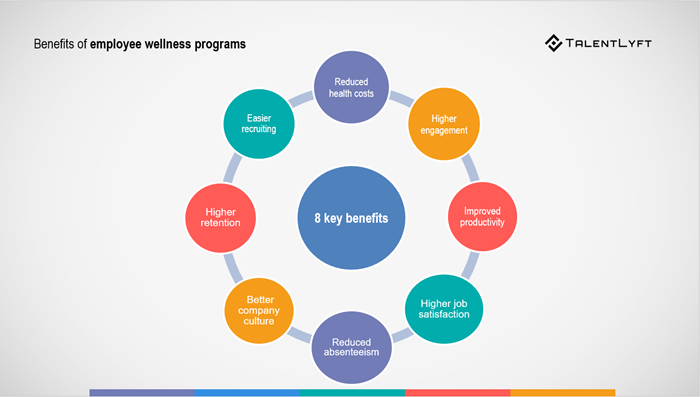 Discover the 8 key benefits of employee wellness programs backed by research! Employee wellness programs are initiatives implemented by employers aimed at maintaining and improving their employees’ health and overall well-being. There are many different types of employee wellness programs. Employee wellness program: Just a fad or a necessity? Employee wellness programs are a relatively new workplace trend. Back until the 1970s, employee wellness programs did not exist. First employee wellness programs started out as employee perks at large corporations. However, these programs started receiving a lot of attention and quickly became a prominent workplace trend, even among mid-sized and smaller companies. Today, employee wellness programs are more popular than ever. According to research conducted by the Society for Human Resource Management, 75% of employers indicated that their companies offered some type of a wellness program, resource or service to employees. Are these employee wellness programs just a passing fad? Or are they becoming a necessity in today’s modern digitalized world? Employees wellness programs have proven benefits, both for employers and employees. The implementation of employee wellness programs results in lower health care costs. A comprehensive review of the literature has concluded that employee wellness programs have the ability to reduce employee-related health care expenditures. Among the 22 different studies that looked at employee wellness programs and healthcare costs, the average return on investment was 3.27. This means that for every dollar that was spent on the program the company saved $3.27 because of reduced healthcare costs. Probably the most famous example is that of Johnson & Johnson’s employee wellness program, which saved a total of over $38 million in its first four years, averaging $224 per patient per year. Companies with employee wellness programs report higher employee engagement. Employee engagement is positively correlated with better health, according to Gallup’s research. A survey by the American Psychological Association has found that an overwhelming 91% of employees at companies that support well-being say they feel motivated to do their best. Employee wellness programs lead to higher employee productivity. According to the Centers for Disease Control and Prevention (CDC), productivity losses related to personal and family health problems cost U.S. employers $1,685 per employee per year, or $225.8 billion annually. However, study after study confirms that employers who implement employee wellness programs consistently report improved employee productivity. The conclusion is clear: Participating in employee wellness programs can help improve productivity levels among employees. Employees in companies that have employee wellness programs report higher satisfaction with their job. The International Foundation of Employee Benefit Plans Workplace Wellness 2017 Survey Report reports that employees in companies who offer employee wellness programs and initiatives are 67% more satisfied than employees in companies who don’t have an employee wellness program. Employee wellness programs lead to reduced absenteeism. Employees in companies that have employee wellness programs are less absent from work. In other words, they are less likely to miss work without a proper reason (such as taking a vacation, doing jury duty, having surgeries, attending funerals, etc.). Employee wellness programs have a positive influence on the company culture. This is in part due to the reason that during these programs employees come together and strengthen their relationships, but also because they feel being taken care of by their employer who really cares about them. Employee wellness programs can help you tackle the problem of employee turnover, thus resulting in higher retention. Employees in companies who have implemented employee wellness programs are less likely to leave their job than employees in companies without these programs. According to research conducted by an American Psychological Association, fewer (only 25%) employees in companies with employee wellness programs said they intend to leave their job in the next year. In companies without employee wellness programs, 51% of employees said they intend to leave their job in the following year. Employee wellness programs have another great benefit - these programs can help you remain competitive within the labor market. Having an employee wellness program enhances your employer brand and makes it easier for you to attract and hire top talent. Candidates are more likely to choose an employer who offers an employee wellness program. Also, companies with employee wellness programs report higher rates of successful employee referrals. 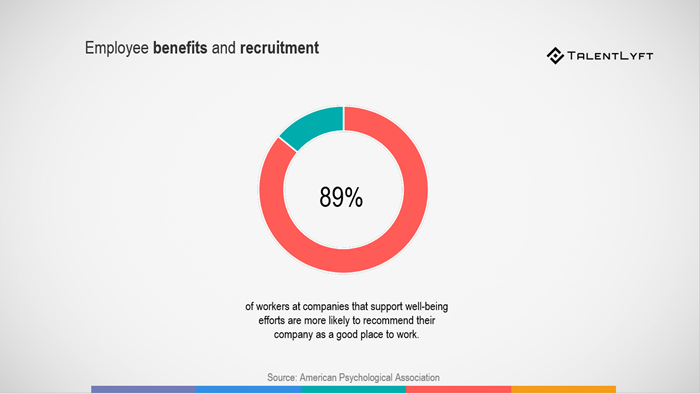 According to the American Psychological Association, 89% of employees at companies that support well-being efforts are more likely to recommend their company as a good place to work. Why should companies have an employee wellness program? Employee wellness programs have multiple benefits, both for the employers and the employees. These programs are the key to your employees AND your company’s health and well-being. Encouraging and helping your employees to stay healthy is beneficial for your company as well. Employee wellness programs have a direct, tangible effect on the productivity and profits of a company. Employees who take part in employee wellness programs are healthier and satisfied with their jobs. As a result, they are less absent from work, more engaged and productive, which means greater profits for the company. Many employers realized that implementing employee wellness programs can help them keep their current employees happy and productive as well as attract new talent. Implementing employee wellness programs can improve your employer brand, build loyalty among current employees and may even save you money! In short, a healthier workplace means that everyone wins. If you want to learn more about employee wellness program, I suggest you check out a short summary of "Workplace wellness that works", by Laura Putnam.